Through poems that celebrate the overlooked beauty in the everyday or that mourn human incursions upon the natural world, Fiona Tinwei Lam weaves polythematic threads into a shimmering tapestry that reveals the complexities of being human in an environment under threat. Inspired by Pablo Neruda’s Elemental Odes, this wide-ranging and diverse collection plays with the yin and yang of everyday existence, employing lyricism, narrative, humour and an occasional dash of irreverence and fun through visual play with text and typography. Watch “Plasticnic,” an animated video poem based on a poem by the same name in Odes & Laments, here. 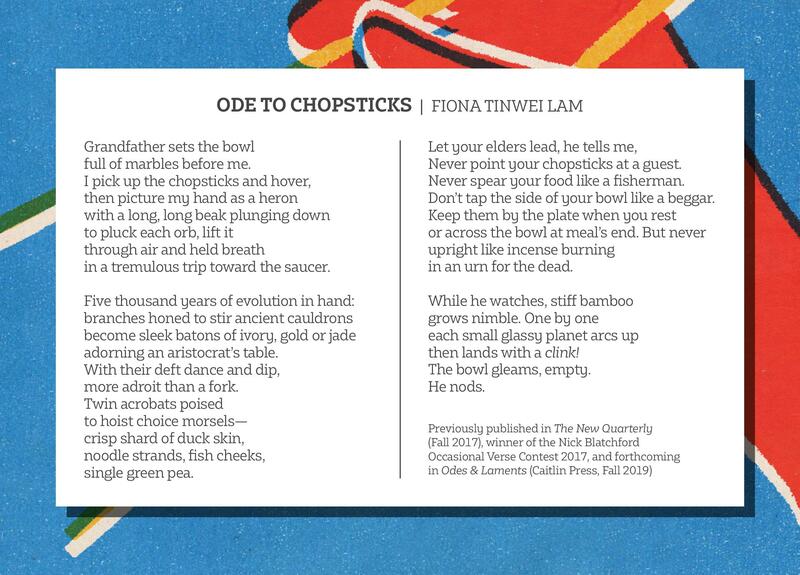 The League of Canadian Poets has selected “Chopsticks,” a poem forthcoming in Odes & Laments, as one of fifteen poems to circulate for National Poetry Month’s Poem in Your Pocket Program. Read it here.